A new lecture series is about to get underway at LMU’s Center for Advanced Studies. Organized by atherosclerosis researcher Christian Weber, the talks will focus on that very special pump – the heart. "Heart Insight", the next lecture series at CAS is devoted to the heart in all of its many facets. As a clinician scientist, what do you find most fascinating about the organ? Weber: Interdisciplinary approaches have always intrigued and attracted me, both in the context of experimental studies and with respect to the translation of laboratory findings into clinical practice. And they have a particularly prominent role to play in medicine. It is the branch of the natural sciences that is most intimately related to human life, and the one that exemplifies the humanist ideal in its broadest sense. Medicine is not just a matter of healing the body. It is entangled with the individual’s overall well-being, with thoughts and feelings, cognition and emotion. This is where our endeavors impinge on other disciplines in the humanities and the arts. And the upcoming lecture series at CAS, which will be given by a group of eminent speakers, attempts to reflect this perspective. The heart is first and foremost a pump. Yet it has long been perceived as the very source of life and the seat of the emotions. Why has this organ acquired such a wealth of associations? Weber: The philosophers of Classical Greece, at least as far back as Aristotle, indeed regarded the heart as the seat of the soul – and of perception itself. But Aristotle‘s idea of the centrality of the heart rested on a misconception of the significance of the brain. He viewed the brain as a kind of cooling device, whose primary function was to dissipate the heat generated by the much more important processes that took place in the heart. That this idea remained so potent for so long, and left such a complex imprint on cultural history, is most probably attributable to the physiological dynamics of the organ: The heart is never idle. Our lives are measured out in heartbeats, and the heart mirrors our moods. – When one is anxious or excited, it beats faster and may even begin to palpitate. This no doubt also explains why love has always been synonymous with the heart in literature and in the visual arts. And phrases such as “cross your heart and hope to die”, or epithets like “open-hearted”, “full-hearted”, hard-hearted”, “heart-rending” or “heart-breaking” can also be explained in terms of its close association with our emotional lives. Much of this cultural imprint is to be found in the figurative arts. How have artists’ views of the organ evolved over the centuries? Weber: In situ, the heart is of course concealed and protected by skin and bone. In the panel paintings and illustrated manuscripts created during the Middle Ages, pictograms were often employed to represent it. Leonardo da Vinci, with his passion for all facets of art and science, was the first artist to peer below the surface, so to speak. He was the first person to depict the anatomy and physiological function of the heart in a series of detailed and realistic drawings. Should these be seen simply as preliminary sketches executed by a great artist or are they part of the more general awakening of interest in the real world during the Renaissance? Weber: Leonardo’s intense interest in the nature of reality was undoubtedly the primary motivation for his anatomical drawings – and this curiosity was to have an immense impact on art. The boundaries between science and artistic representation were extremely fluid at that time. Take for example the paintings and statues produced during the High Renaissance. In their realistic depiction of volumes and their textural precision, it is clear that works such as Michelangelo’s David could not have been made without meticulous anatomical studies based on vivisection and anatomical dissections. What about later periods in the history of art? Weber: In the succeeding centuries, indeed right up to the present day, hearts – depicted in many forms and contexts – have always found a place in the plastic and visual arts. 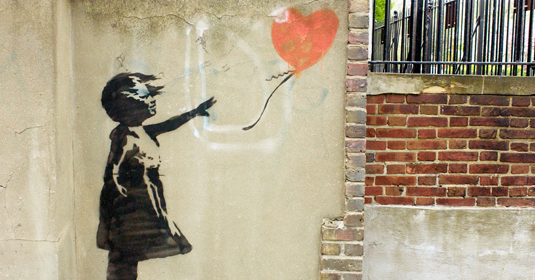 As a very recent example, take the girl with a red, heart-shaped balloon depicted on a wall by the street artist Banksy. Or take a look at the picture by the artist Karl Otto Götz here in my office. Götz taught many of the best-known post-war German artists, was a supporter of Joseph Beuys and was one of the founders of Informel. The French term informel refers to a form of abstract art, in which the artist constructs non-geometrical shapes from marks produced by a sequence of spontaneous gestures. Götz has, for instance, created photographic works by ‘painting’ with a flash-lamp on light-sensitive paper, again using spontaneous, flowing movements. And in these works, one also finds heart-shaped forms – whether or not these were intentional is quite irrelevant. Those are just two arbitrarily chosen examples of hearts as iconic elements in the work of two contemporary artists. The series begins at CAS on May 16th with a lecture on the emergence of ‘cardiocentrism’ in classical philosophy. Weber: That’s right. The talk by Peter Adamson, a philosopher at LMU, will outline the development of this idea in Greek and Islamic philosophy and explore its later ramifications. The second lecture will be given by cultural historian Fay Bound Alberti of Queen Mary University in London. She has made a special study of the history of emotion, and has written several books on the subject, including Matters of the Heart – History, Medicine and Emotions. Barbara Vinken, a literary historian at LMU, will then be looking at how creative writers have depicted such matters as lonely hearts and broken hearts in their works. That in turn prompts the question of how a broken heart might be mended. So Thomas Eschenhagen from the University Medical Center in Hamburg-Eppendorf, will discuss current efforts to grow organized tissues in culture starting from isolated stem cells, otherwise known as tissue engineering. These could then be applied to the myocardium like sticking plaster to boost cardiac function in patients who have had an acute heart attack or are suffering from progressive heart failure. The final lecture, scheduled for the beginning of the coming Winter Semester, will be given by Jeroen Bax of Leiden University, who will talk about the latest trends in functional imaging of the heart. In a sense, this brings us back to our starting point – to the first realistic depictions of the heart by the artists of the Renaissance. Like earlier lecture series at the CAS, this one is intended to initiate a new Research Focus. But can such a series provide more than a compilation of disparate views, or a selection of associative links? Can it really highlight new opportunities for interdisciplinary interactions and strategies? Weber: I’ll give just one example for the kinds of insights that can result from interactions between apparently disparate fields. Pathologists recently discovered that the heart and the brain are much more closely linked to each other than has hitherto been suspected. These links can extend directly into the blood vessels. For instance, it is now known that the brain directly innervates the blood vessels via what is called the adventitia, the sheath of connective tissue that surrounds the jugular vein or the coronary arteries. When an atherosclerotic plaque ruptures and induces a myocardial infarction, this type of anatomical connection makes it possible to deliver stress signals much more rapidly to the blood vessels than would be possible if such signals had to be conveyed by hormones from the endocrine organs via the circulation. The unexpected perspectives that can emerge when one takes a more comprehensive view can lead to entirely new interdisciplinary synergies and avenues of research. Prof. Dr. med. 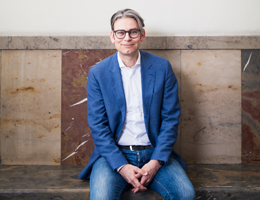 Christian Weber is the Director of the Institute for Prophylaxis and Epidemiology of Cardiovascular Diseases and holds a Chair in Preventive Vascular Medicine at the Munich University Medical Center.